There’s two of us eating (mostly) 3 meals per day. My husband occasionally eats take-out lunch at work, & that $ comes out of his personal cash stash. This week, I spent $101.33, with a monthly total of $297.04. That leaves $102.96 for the rest of October. I placed an unexpected order at iHerb.com because all the Frontier Natural & Simply Organic products were on sale @ 20% off. I couldn’t resist! So, with 1½ weeks left in October, I think I’ll be okay sticking to my budget total. I’m excited to end my full year of budgeting at the end of the month too! And even more excited to start a new budget year in November! Freebie! This week, DH went on an ocean fishing trip and came home with pounds of fish! I kept the haddock and “red fish” and packed in the freezer. We had enough cod and cutter fish to share with both sets of parents too! iHerb.com $20.29: Unexpected sale on Frontier Naturals. I love their products, so I stocked up: Caraway seeds, fair trade vanilla, active dry yeast, & poppy seeds. It’s been driving me crazy lately. Every time I make a cup of tea, no matter how long I steep, the tea tastes horribly bitter! I think I finally figured out why. My water was too hot! I boil my tea water using an electric kettle, and boy does the water get hot, I think too hot. Once I stopped the heat at just under a rolling boil, my tea has been tasting so much better. Yay! Now that the cooler weather is here, I’ve been wanting to make more tea, and especially green tea. This week, I spent $69.57, with a monthly total of $195.71. That leaves $204.29 for the rest of October. I did very well this week. Last night, I made the choice to NOT go to a sit-down restaurant, but opted for take-out instead, saving $10-$20. With 2½ weeks left for October, I am confident that I’ll remain within my budget. I’m shooting for $70-$75 spending for next week. Whole Foods is having a month-long sale on whole chickens at $.99lb and I really want to pick up at least 3 or 4 for about $15-$20. I know it’s not “local” or pastured, but it’s nice to save a little money once in awhile on a loss leader product. I also am thinking of stocking up on a couple of packages of their 365 whole wheat flour, on sale for $2.50. Wilson Farm $14.49: (2) 3lb bags o’ carrots, scallions, Kendall apples, red leaf lettuce, green cabbage, white cauliflower, PLUS another freebie of beet greens from another shopper that didn’t want them! Why Toss Away Those Greens? I was shopping at Wilson Farm, and this was the second time I got a freebie bag of greens that another customer didn’t want. The first time, I scored a huge batch of radish greens, and today I gained the tops of chioggia beets. Funny, during both instances they asked what do I do with them? I eat them! Raw or cooked. They are great in salads, soups, stir-fries. In an economy where food prices are soaring, why would you pay $4 for a bundle of beets only to throw away a perfectly edible portion? It could be the location I was in. Wilson Farm is in Lexington, MA, one of the snootier “higher income” towns in the state. Could be that money isn’t really an issue for most that live there, and they couldn’t be bothered to cook up some lowly greens! But sadly, I bet that even consumers in my middle class town throw away their root veggie “greens” as well, maybe because they don’t look “perfect”, or maybe because no one knows that you can actually eat them. Hopefully, my brief conversation sparked something in their minds, and maybe next time they shop, they won’t be so quick to toss the greens. Maybe they’ll actually take them home and try them. Author debbie @ That's Just MePosted on October 10, 2012 October 12, 2012 Categories FoodTags beet greens, budgeting, FOOD, frugal, greens, grocery shopping, radish greens, radishes, vegetables, waste1 Comment on Why Toss Away Those Greens? I had an over-abundance of eggplant this season. Thankfully I planted the “little fingers” variety which resulted in small thin eggplants. I added a lot to tomatoes (and peppers) to make sauces, which I froze in freezer bags. But my freezer was getting full, so I searched for a better, more compact way to preserve eggplant. Yay! Oven drying (or dehydrating if you are lucky enough to own a dehydrator) to the rescue, similar to the process I used for my tomatoes. 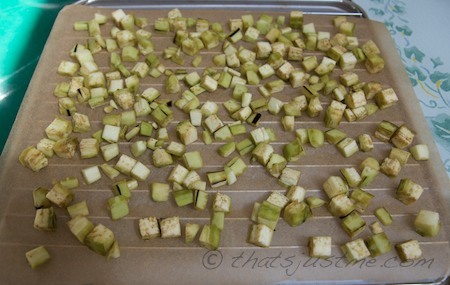 First, I chopped the eggplant into smaller pieces. 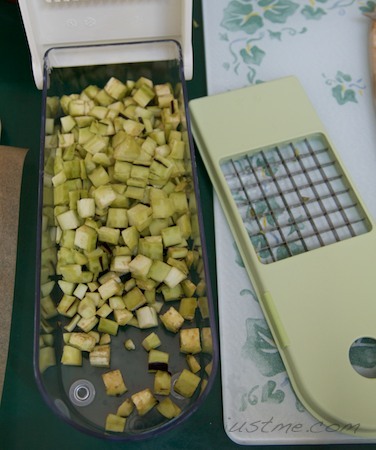 I used my “Vidalia Chop Wizard” – I’ve had this gadget for years. I don’t use it every day, but when I need small, even pieces, it works well. It’s very loud though, when you push down on it. I scattered the eggplant pieces on a shallow grill sheet pan (included with my countertop oven) covered with parchment paper. Drying at about 150° in my smaller counter top oven, it took a couple of hours. The pieces should be dried, but not rock hard. I allowed the eggplant to cool for a few minutes, then scattered them on a large dish and put into the freezer to “flash-freeze” – this ensures they stay as individual pieces when bagged later. I’m storing in freezer to add to winter soups and sauces! I’ve oven dried several batches of eggplant, and just kept adding to the freezer bag. Wow, this year, surprisingly I found that I really enjoy the craft of canning! It’s a lot of work, but once you get 2 or 3 batches under your belt, there’s confidence and organization that makes the process a little bit easier. The rewards will outweigh the work! There was a lot that I was worried about in the beginning (like most newbie canners), most importantly was I did NOT want to kill myself and my family with deadly bacteria! 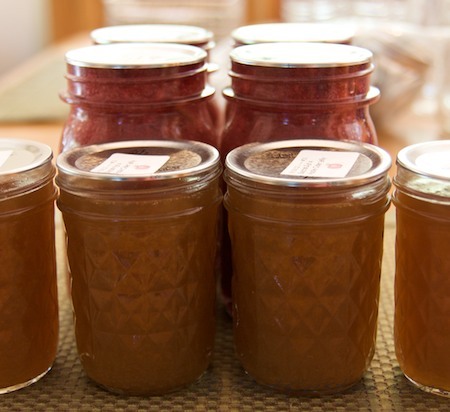 But after reading a lot of library books, and scouring the web for good information, I learned that if done properly, following the instructions, you do not have to fear the canning process! This post is L-O-N-G, and it might be boring to a lot of visitors, so if you want to learn more about my canning experience (and see a few photos), read onward! This week, I spent $126.14, so that leaves $273.86 for the rest of October. Starting out a little strong, but that’s usually how it is at the beginning of the month! The other morning, I picked some of my carrots. They were delicious! I was so worried about them at the beginning of the season because the greens were eaten by critter(s) but they rebounded. All it takes is a little time, and yum, fresh garden carrots! I’ll be planting these again next year for sure. Oh and the carrot tops ARE edible, contrary to rumors that they are poisonous. PS And the green tomatoes I harvested days ago are slowly turning red. We should have one or two more batches for sauce. 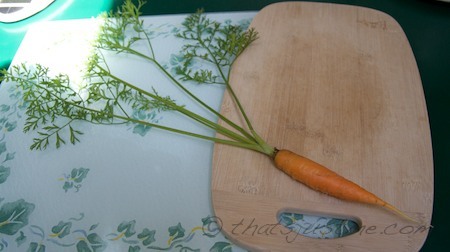 Update: 2012-10-9: Pulled up the last of my carrots. I’m so happy that they worked out this year! Now that I know how relatively easy they are to grow, next season I’ll definitely plant more. 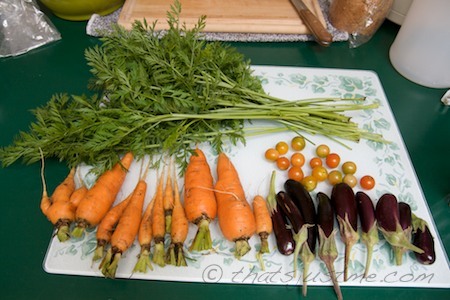 Oct 9: 2nd and last harvest of carrots (2.5lbs) – I think a nice hardy cream of carrot soup is in order! 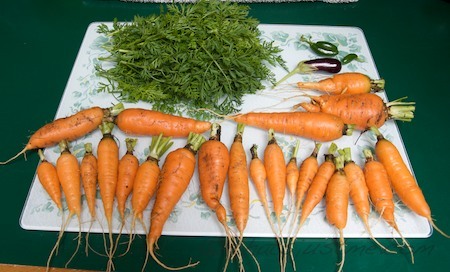 Author debbie @ That's Just MePosted on October 4, 2012 October 9, 2012 Categories FoodTags carrot tops, carrots, FOOD, gardening, healthy2 Comments on Gardening Diary: Carrots! Okay, so I think I’m on board for the October Unprocessed – 2012, starting TODAY. I know I sound very hesitant, and I am. Partly because I think some pledged people go a bit too far with their views of “unprocessed” and it can drain the joy out of eating. LOL. I like to use “Food Rules” by Michael Pollan as my reference to unprocessed eating instead. Using the ole “if grandma had it in her kitchen” rule as my guide. I’m also a little hesitant, partly because I did it last year and IT WAS DIFFICULT! I feel like I’m gonna fail before I even start…..but I have to have a better attitude than that! On a positive note, last year was very eye-opening. I lost a couple extra pounds, and so many of the guest authors on Andrew’s blog were awesome! I learned a lot! So, yeah I’m going to try it again this year. I had a few “considerations” last year and I have a few this year as well. Chocolate – I lean toward fair-trade brands. I feel it’s more important than worrying about a little soy and/or white sugar in the list of ingredients, which brings me to my second consideration. 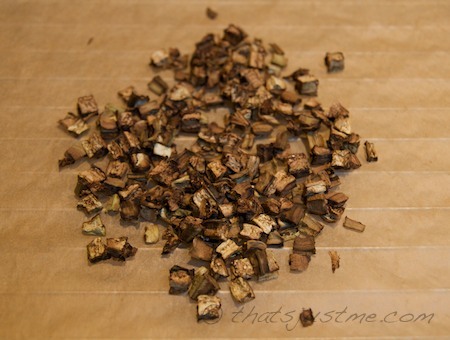 White Sugar – yes, I have white sugar in my cupboard. Again, it goes back to grandma’s kitchen. No, I don’t make a habit of using a lot of it, but I do use it for canning my jams/jellies, but I’m using a much smaller amount than most commercial preserves. White Flour – yep, I use white flour. I add it (sometimes up to half) in my homemade bread. What’s more important? Homemade bread with a little white flour or commercially made bread with only whole wheat? I’d rather control my ingredients and make it from scratch. Eating Out – Okay, this one is tough. We don’t eat out a lot, and I’m gonna try my hardest not to eat at any fast food or chain restaurants this month, but there might be days when I just need take-out Italian or Chinese. I’ll hoping to stick to local restaurants, but I’m not going to go too crazy and worry about the ingredients on the menu. All I can do is my best! Here we go! Happy October 1st! And good luck to anyone taking the pledge!